Current space missions are heavily dependent on chemical rocket propulsion for the launch into space, for changing orbits, and for attitude control. For the launch, rockets with chemical propulsion engines are used because there is simply no other way to put anything in orbit. Launcher technology has improved a great deal over the last 60 years, so that rockets can now transport their payload more precisely to the desired orbit, are able to place multiple satellites into different orbits, and to do this with increased reliability and safety. However, improvements in actual payload capability and launch cost have not been dramatic. 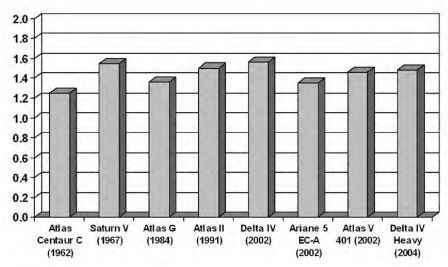 Rocket engines have become somewhat more efficient, but the increases in thrust per amount of propellant have been relatively small. It appears we are currently reaching the limits of chemical rocket propulsion performance; any small increase in efficiency now requires such large amounts of development work, time, and money that it is often not worth the effort. In addition, the structural masses (the mass of the propellant tanks and support structures) of rocket stages have not improved much over the last 50 years. The launchers in use today are very similar to those that were developed in the 1950s to throw nuclear bombs at other countries. 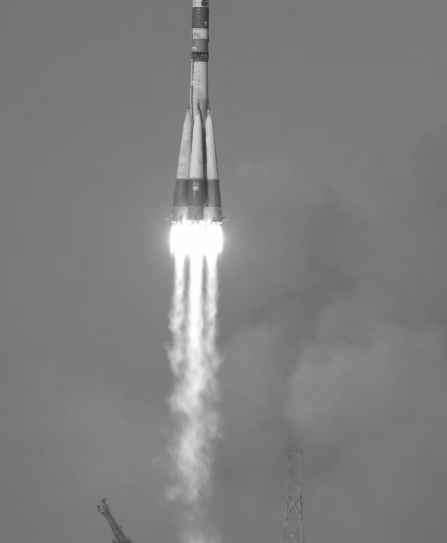 Modern rockets such as the American Atlas V and the Russian Soyuz are even direct descendants of early intercontinental ballistic missiles (Fig. 2.1). All in all, the total mass that a certain type and size of launcher can put into a certain orbit has not improved very much since the 1960s. Looking, for example, at the total satellite payload mass that launchers can put into a low Earth orbit (LEO) as a percentage of their total lift-off mass, it becomes clear that this number has been close to 3.5 percent for the last 40 years or so (LEO extends to an altitude of about 2000 kilometers, or 1.240 miles). For geosynchronous transfer orbit (GTO) payloads, that percentage has been a steady 1.5 percent for the same period. A GTO is an elliptical orbit in which a geosynchronous orbit [GEO] satellite is initially launched in order to reach GEO altitude; at the GTO's apogee, a rocket motor is ignited to place it in a circular, geosynchronous orbit. For many modern launchers these percentages are even lower, depending on what the rocket is designed to do and how sophisticated it is (Figs. 2.2 and 2.3). All launchers except the Space Shuttle are still of the expendable type, meaning they can be used only once. They drop off their empty stages along the way as a means of getting rid of dead weight. These stages then splash into the ocean or burn up in the atmosphere; outfitting them with retrieval equipment such as parachutes or deployable wings would make the launcher too heavy. Once the satellite cargo has been put in orbit, no part of these expensive machines is left for reuse. Figure 2.2: Payload mass as a percentage of a rocket's total lift-off mass, to an optimum low earth orbit (LEO), which is different for each launcher and launch site. The launchers shown represent the best of their generation in terms of payload mass to LEO. Figure 2.3: Payload mass as a percentage of a rocket's total lift-off mass, to a geostationary transfer orbit (GTO). The launchers shown represent the best of their generation in terms of payload mass to GTO. 289 metric tons (640,000 pounds) of propellant, but that is relatively inexpensive). A Soyuz-Fregat launch therefore costs on the order of $45 million, which is actually relatively cheap compared to most European and United States rockets. Improvements in how we develop, produce, and operate launchers can still decrease launch costs somewhat, as shown by SpaceX with its Falcon series of launchers, but we should not expect dramatically lower launch costs per kilogram satellite in orbit with any new expendable launchers. An obvious way to lower launch costs is to reuse rockets. Instead of having to pay for a completely new one every time we need to put up a spacecraft, we would then only need to pay for the propellants, operations, and maintenance of the launch vehicle, such as with an airplane. Planes are not thrown away after each flight. The reason that expendable rockets are still the norm is that we have not had much success developing reusable systems. 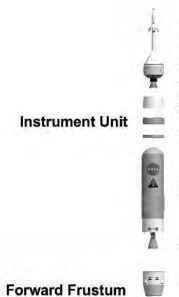 To make a launch vehicle capable of being used again, it needs additional equipment to return to Earth. Heat shields, wings, parachutes, and additional propellant for landing make reusable systems relatively heavy. As the satellites on top of expendable launchers comprise only a few percent of the total launch mass, the mass available for useful payload is easily eaten up by additional components added to make the system reusable. The fact that rocket engine efficiency and structural mass reductions are already close to their achievable limits means that it is very hard to compensate the mass growth in a reusable launcher design. Many concepts for reusable systems, therefore, would be capable only of launching and flying back the bare vehicle itself, without any mass allocation to spare for spacecraft cargo such as satellites and space station modules. Reusable launchers are also more difficult and therefore more expensive to develop than expendable launchers. On top of the difficulty of developing something that can go into orbit, now the vehicle also needs to be designed to come back, which involves reentry into the atmosphere, a descent phase, and a soft landing. Furthermore, the use of such launchers requires not only a launch pad but also the development of additional infrastructure, such as a safe landing area, vehicle and engine maintenance buildings, and logistics facilities to store and manage the distribution of spare parts. Instead of these recurring costs for a reusable system, every expendable launch involves a brand new vehicle, and therefore operations are limited to the launch preparations and the actual flight. In addition to this, however, a reusable launcher requires inspection and maintenance before each subsequent mission. The operations costs for reusable systems are therefore also higher than in the case of expendable rockets. The Space Shuttle orbiter, for example, excluding the effort for its main rocket engines, requires a maintenance team of some 90 people, each working about 1000 hours after each mission. This costs about $8 million per flight on maintenance labor alone. Together with the maintenance hours on the three large Space Shuttle main engines and the two reused solid rocket boosters, this represents a huge amount of money that does not need to be spent when using expendable, single-use rockets. Moreover, the Space Shuttle system is not fully reusable: the large brown external tank is discarded during each flight, so a new one is needed for every mission. The higher development, infrastructure, and maintenance costs mean that operating reusable launchers can result in lower launch prices only if they make many flights each year. It is just like with commercial airlines, which need to keep their planes in the air for as many hours as possible to keep costs down. This requires short maintenance cycles; otherwise a large and therefore expensive fleet of vehicles would be needed. To justify launching many spaceflights, we also need a large number of customers who require the launch of many more payloads than is currently the case. The launch market will significantly increase in size only if launch prices drop dramatically, which in turn requires efficient reusable systems with little maintenance needs. This is a really difficult catch-22 situation: launches could become cheaper if there was a sufficiently large market, but this market will not grow until launch costs drop significantly. The maintenance of the (partially) reusable Space Shuttle turned out to be so time-consuming that the initial expectations of launching some 60 missions per year never became a reality; in a good year, the shuttle is launched about six times. The high maintenance and replacement costs and the low launch rate have resulted in very high launch costs. Before the Columbia disaster, a Space Shuttle launch with all its complicated pre-launch activities and human spaceflight equipment was costing on the order of $300 million to $500 million per flight. The additional safety constraints put in place after the loss of Columbia probably put the current cost way over half a billion dollars per flight. This makes the Space Shuttle the most expensive launch vehicle, both in total launch price and in cost per kilogram payload put in orbit. For the current relatively few satellite launches per year, it is cheaper to use expendable, one-shot rockets. The reason that the Space Shuttle is still in use despite its disadvantages is that it is the only vehicle the United States has available for human spaceflight. In fact, for the relatively few crewed missions it foresees to the Space Station in the 2010s and to the Moon in the 2020s, NASA has found that it will be less expensive to operate classic expendable rockets and capsules rather than some kind of reusable shuttle system. NASA has therefore decided that the successor of the Space Shuttle to launch astronauts, the Ares I launcher, will be an expendable system that is not too different from the rockets used to launch the early pioneering astronauts of the Mercury, Gemini, and Apollo space programs in the 1960s. Ares I will be topped with an Orion capsule that may be partly reusable, but is otherwise very similar in design to the Apollo Command and Service Module combination of 40 years ago (Fig. 2.4). For launching large cargoes such as lunar base modules, NASA will develop the Ares V, which will be a mostly expendable rocket (only the solid rocket boosters derived from the Space Shuttle system maybe reused) (Fig. 2.5). New versions of the Ariane, Atlas, Delta, and Soyuz rockets are also still being developed, and it does not look like these expendables will become obsolete and replaced by reusable launch vehicles anytime soon. Radically lowering launch prices for traditional rocket propulsion systems, even by means of reusable equipment, is extremely difficult. The SpaceX company in the United States is now offering its expendable Falcon 1 launcher, and the advertised launch price of $7 million means a significant drop in price with respect to that of the competition, which is about double for the same payload. Using larger successors of Falcon 1, SpaceX believes it will be able to offer prices on the order of $1000 per kilogram payload in low Earth orbit by 2010. Since the current cost is about $5000 per kilogram for large launchers (and about $10,000 per kilogram for small launchers with small payload capabilities), this would mean a significantly lower launch cost. However, it is still a lot of money. For example, taking into account also the mass of the spacecraft, flying as a space tourist with SpaceX would still mean a ticket price of about $1 million to $1.5 million—much less than the $20 million paid by recent space tourists flying with the Russian Soyuz to the International Space Station, but still a lot more than most people can afford. efficient space planes. If novel concepts and technology can drop launch prices to levels that make it affordable for smaller countries and organizations to launch satellites and people into space, the market may grow enough and launch rates may increase sufficiently to warrant the development of even better reusable systems. make new applications such as lunar mining, microgravity industries, mass space tourism, and Mars colonization economically viable. Instead of $1000 per kilogram payload in low Earth orbit, it would take prices on the order of $10 per kilogram or less to make the cost of a flight into space comparable to that of transportation by airplane. Rocket propulsion is not only used to launch things, it is also the main means for maneuvering and changing orbits, and for controlling the attitude of spacecraft. Relatively large thrusters are used for trajectory adjustments, changing orbit altitude and inclination (the angle of the orbit with respect to the planet's equator), and braking (for getting into orbit around another planet when arriving there with too high velocity from an interplanetary transfer flight). Smaller thrusters, often on the order of a couple of tens of newton force, are used for attitude control and delicate maneuvering (with 1 newton being equivalent to the force that gravity exerts on a 100-gram [0.2-pound] mass on Earth's surface). The mass of the required propellant, rocket thrusters, tanks, pipes, and valves often comprises a large part of the total spacecraft mass. The Venus Express spacecraft of the ESA, for example, had a total mass of about 1270 kg (2800 pounds) when it was sent on its way. 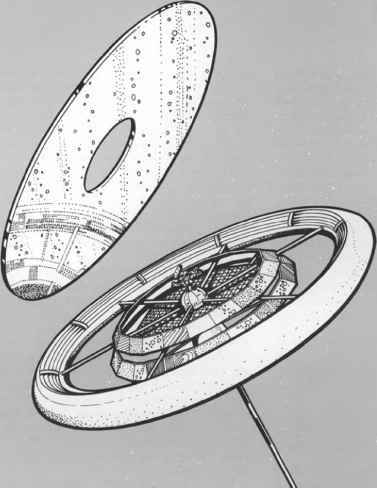 No less than 570 kg (1260 pounds) of this was propellant, while the propulsion hardware had a mass of 60 kg (130 pounds); the propulsion subsystem thus accounted for about 50 percent of the total mass! Even when orbit adjustments are not needed, the attitude control (stabilization) and orbit maintenance of satellites requires a lot of propellant. About 30 percent of the total mass of a typical geostationary communications satellite with a lifetime of 15 years consists of propellant for so-called station keeping. How to get rid of chemical rockets?